I hope my city is not going to be the first zombie nation! A loud explosion at the Husky Lima Refinery shook Lima and the surrounding area early on Jan 10, 2015. Authorities said there’s no immediate danger to the area, although the fire continues to burn. 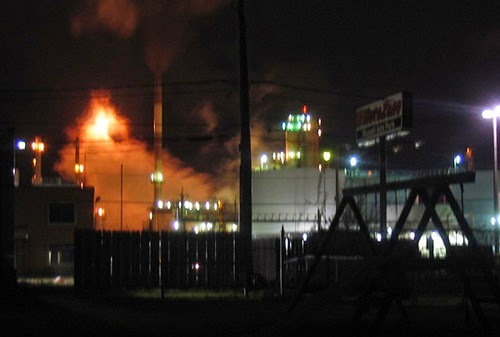 An isocracker at the refinery exploded around 6 a.m. While the isocracker continues to burn, the flames and fumes neighbors notice are strictly oil burning off and shouldn’t pose a threat to the environment or residents. The company was “managing the situation” at 8 a.m. He said the fire started on a processing unit. All personnel had been accounted for, and there were no reported injuries, he said. There was one unrelated injury of a man with a head injury. Sgt. Andy Green, of the Lima Police Department, said the fire was still burning, but residents should be safe if they remain in their homes. Traffic was restricted in all directions near the refinery, essentially from Fourth Street to Vine Street. Only emergency responders are allowed to approach, according to the Lima Police Department.